In 1898, Camillo Golgi, an eminent Italian physician and pathologist, published a landmark paper on the structure of “nervous cells.” In addition to the organelle that still bears his name, the Golgi apparatus, he described “a delicate covering” surrounding neurons’ cell bodies and extending along their dendrites. 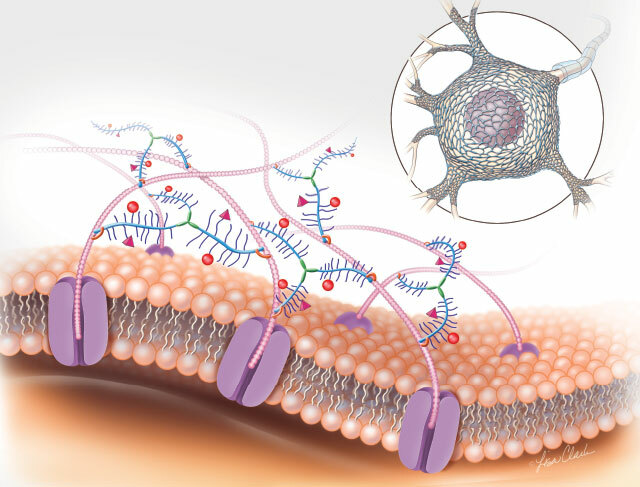 That same year, another Italian researcher, Arturo Donaggio, observed that these coverings, now known as perineuronal nets (PNNs), had openings in them, through which, he correctly surmised, axon terminals from neighboring neurons make synapses. Since then, however, PNNs have been largely neglected by the scientific community—especially after Santiago Ramón y Cajal, a fierce rival of Golgi (who would later share the Nobel Prize with him), dismissed them as a histological artifact. 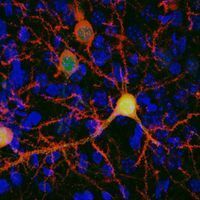 It wasn’t until the 1970s, thanks to the improvement of histological techniques and the development of immunohistochemistry, that researchers confirmed the existence of PNNs around some types of neurons in the brain and spinal cord of many vertebrate species, including humans. Composed of extracellular matrix (ECM) molecules, PNNs form during postnatal development, marking the end of what’s known as the “critical period” of heightened brain plasticity. For a while after birth, the external environment has a profound effect on the wiring of neuronal circuits and, in turn, on the development of an organism’s skills and behaviors, such as language, sensory processing, and emotional traits. But during childhood and adolescence, neuronal networks become more fixed, allowing the individual to retain the acquired functions. Evidence gathered over the past 15 years suggests that PNNs contribute to this fixation in many brain areas, by stabilizing the existing contacts between neurons and repelling incoming axons. Because limited neuronal plasticity underlies the irreversibility of many afflictions of the central nervous system (CNS), from stroke to spinal cord injury to neurodegenerative diseases, PNNs have been considered promising targets to enhance CNS repair. 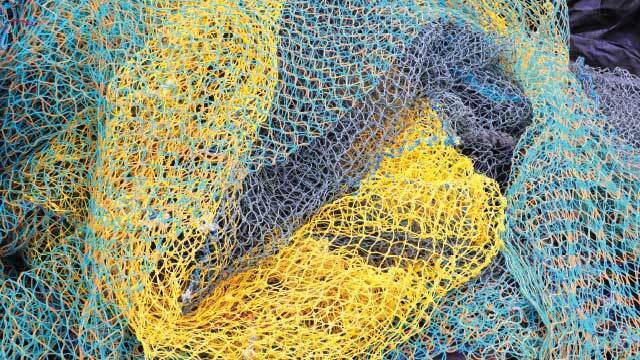 Moreover, they are increasingly recognized as important players in the regulation of memory processes. Increasingly, researchers are turning to PNNs as potential targets to enhance plasticity for the treatment of various diseases, from amblyopia to neurodegenerative diseases to psychiatric disorders such as schizophrenia and addiction. A lot of progress has been made in the last two decades toward illuminating the structural and functional properties of PNNs, defining their roles in CNS plasticity, and developing methods to manipulate them to increase plasticity, memory, and CNS repair. Still, how exactly PNNs work in the brain, and which precise mechanisms underlie their remodeling in physiological or pathological conditions, are still open questions. Currently, chondroitinase ABC is widely applied for removing PNNs in experimental animals, but it lacks specificity, causing a degradation of ECM molecules not only in PNNs but throughout CNS tissue. Researchers are looking for more subtle ways to manipulate the PNN in animal models in order to further understand their functions as well as to fine-tune neuronal plasticity. Additionally, while behavioral studies have clearly demonstrated the role of PNNs in mediating the plasticity of the brain, researchers still don’t have a good grasp on the molecular details of these processes. Recently, revelations about the composition of PNNs have begun to yield clues. THE STRUCTURE OF THE PNN: The PNN is composed of chondroitin sulfate proteoglycans (CSPGs), which are made of a core protein (blue) flanked by a number of sugar chains (dark purple). CSPGs bind to hyaluronic acid (pink balls), which is secreted by membrane-bound enzymes. Link proteins (orange) stabilize the interaction between hyaluronic acid and CSPGs. Sema3A and Otx2 (pink pyramid and red ball, respectively) bind to the sugar chains of the CSPGs. Tenascin-R (green) acts as a cross-linking protein among several CSPGs, contributing to the macromolecular assembly of the PNN. Another potential mediator of PNN-controlled plasticity is the axon guidance molecule Semaphorin 3A, a CSPG-binding molecule that is highly concentrated in the PNNs of distinct neuronal populations in the mature brain. Recent experiments have shown that neurons cultured on PNN sugars grow shorter neurites and that this inhibition is enhanced by the presence of Semaphorin 3A.13 But the effect of Semaphorin 3A binding to the PNNs has yet to be determined. PNNs may also act through direct interactions with receptors for CSPGs on neurons, as occurs after a CNS injury, in which CSPGs upregulated in the injury site inhibit axon regrowth by binding to specific receptors. However, so far, no clear evidence exists about the presence of CSPG receptors on PNN-bearing neurons or synapses.Although the mechanisms that allow PNNs to influence neuronal plasticity remain unclear, the effects of that influence are well documented. Increasingly, researchers are turning to PNNs as potential targets to enhance plasticity for the treatment of various diseases, from amblyopia to neurodegenerative diseases to psychiatric disorders such as schizophrenia and addiction. In accordance with findings showing a role for PNNs in memory, increasing evidence points to the involvement of PNNs in drug-associated memories. Environmental cues formerly associated with drug use (such as people or situations) can become strong triggers for drug-seeking behavior, contributing to the development of addiction. Therefore, disrupting these associations could aid in the treatment of addiction. Genetic studies have identified several ECM- and PNN-regulating molecules as potential contributors to the etiology of autism. Studies on rodents show that PNNs in the dorsal cerebellar cortex might play an important role in the formation and maintenance of cocaine-associated memories,14 and in the prefrontal cortex, PNNs are decreased after heroin self-administration but rapidly increased after reexposure to heroin-associated cues.15 Conversely, degrading PNNs in the prefrontal cortex reduces the acquisition and maintenance of cocaine memory in rats,16 while PNN degradation in the amygdala following an exposure to morphine, cocaine, or heroin inhibits relapse in the animals.17 On the whole, PNNs appear to be necessary for creating and/or maintaining drug-related memories, and thus may serve as targets for weakening memories that drive relapse. Sometimes it’s not the presence of PNNs that is the problem, but rather aberrations in their structure. 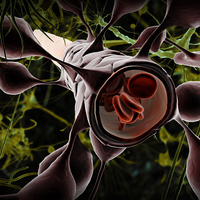 For instance, researchers have observed decreased densities of PNNs, or PNNs with degraded morphology, in brain areas responsible for complex cognitive functions, such as the frontal cortex and entorhinal cortex, in subjects with Alzheimer’s disease, suggesting that neurons with PNN alterations might be vulnerable to cell death. Although many questions remain unanswered, research has clearly demonstrated that targeting PNNs holds great promise for the treatment of several brain diseases. So far, no compounds that target PNNs are drug candidates, as they are too general in their disruption, but scientists are working to identify specific PNN components to zero in on. 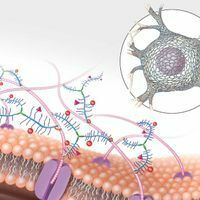 While finding noninvasive ways to precisely target PNNs in specific areas of the human brain still represents a challenge, researchers are hopeful that this could be a promising avenue for a variety of therapies in the coming decades. Daniela Carulli is an assistant professor in the Department of Neuroscience at the University of Turin in Italy and a member of the Neuroscience Institute Cavalieri Ottolenghi. W. Härtig et al., “Cortical neurons immunoreactive for the potassium channel Kv3.1b subunit are predominantly surrounded by perineuronal nets presumed as a buffering system for cations,” Brain Res, 842:15-29, 1999. 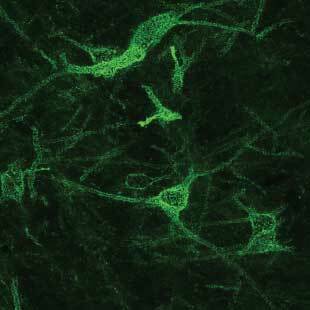 J.-H. Cabungcal et al., “Perineuronal nets protect fast-spiking interneurons against oxidative stress,” PNAS, 110:9130-35, 2013. D. Carulli et al., “Animals lacking link protein have attenuated perineuronal nets and persistent plasticity,” Brain, 133:2331-47, 2010. T. Pizzorusso et al., “Structural and functional recovery from early monocular deprivation in adult rats,” PNAS, 103:8517-22, 2006. A. Sale et al., “Environmental enrichment in adulthood promotes amblyopia recovery through a reduction of intracortical inhibition,” Nat Neurosci, 10:679-81, 2007. A. Faralli et al., “Modifications of perineuronal nets and remodelling of excitatory and inhibitory afferents during vestibular compensation in the adult mouse,” Brain Struct Funct, 221:3193-209, 2016. C. Romberg et al., “Depletion of perineuronal nets enhances recognition memory and long-term depression in the perirhinal cortex,” J Neurosci, 33:7057-65, 2013. 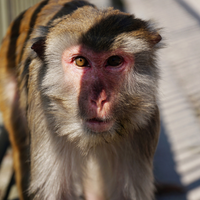 N. Gogolla et al., “Perineuronal nets protect fear memories from erasure,” Science, 325:1258-61, 2009. S.B. Banerjee et al., “Perineuronal nets in the adult sensory cortex are necessary for fear learning,” Neuron, 95:169-79, 2017. E.H. Thompson et al., “Removal of perineuronal nets disrupts recall of a remote fear memory,” PNAS, 115:607-12, 2018. M. Beurdeley et al., “Otx2 binding to perineuronal nets persistently regulates plasticity in the mature visual cortex,” J Neurosci, 32:9429-37, 2012. H.H.C. Lee et al., “Genetic Otx2 mis-localization delays critical period plasticity across brain regions,” Mol Psychiatry, 22:680-88, 2017. F. de Winter et al., “The chemorepulsive protein Semaphorin 3a and perineuronal net-mediated plasticity,” Neural Plast, 2016:3679545, 2016. M. Miquel et al., “Have we been ignoring the elephant in the room? Seven arguments for considering the cerebellum as part of addiction circuitry,” Neurosci Biobehav Rev, 60:1-11, 2016. M.C. Van den Oever et al., “Extracellular matrix plasticity and GABAergic inhibition of prefrontal cortex pyramidal cells facilitates relapse to heroin seeking,” Neuropsychopharmacology, 35:2120-33, 2010. M. Slaker et al., “Removal of perineuronal nets in the medial prefrontal cortex impairs the acquisition and reconsolidation of a cocaine-induced conditioned place preference memory,” J Neurosci, 35:4190-202, 2015. Y.-X. Xue et al., “Depletion of perineuronal nets in the amygdala to enhance the erasure of drug memories,” J Neurosci, 34:6647-58, 2014. 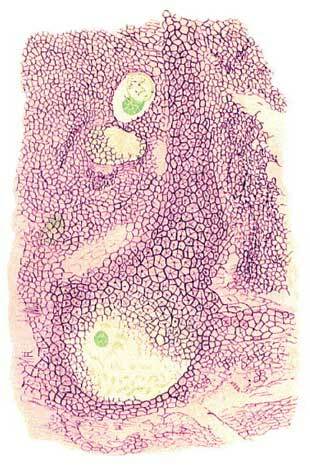 D. Wang, J. Fawcett, “The perineuronal net and the control of CNS plasticity,” Cell Tissue Res, 349:147-60, 2012. S. Yang et al., “Perineuronal net digestion with chondroitinase restores memory in mice with tau pathology,” Exp Neurol, 265:48-58, 2015. H. Pantazopoulos, S. Berretta, “In sickness and in health: Perineuronal nets and synaptic plasticity in psychiatric disorders,” Neural Plast, 2016:9847696, 2016.